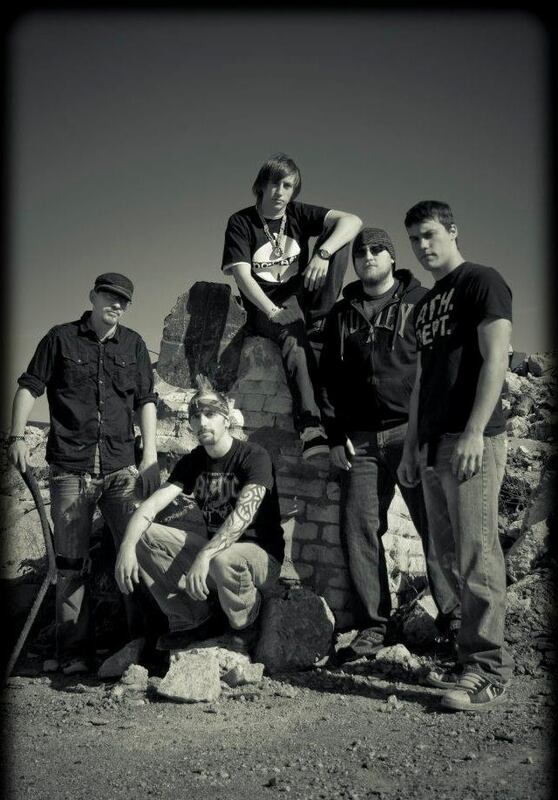 I wasn’t sure where to start with Resistance 13, a hard rock/metal/alternative band from the Ohio Valley that includes Jeremy Wright on vocals, Bryan Schneider and Leon Kinney on guitar, Bryan Meeks on bass and Louie Balk on drums. They have so much to say, yet their self-worth stance is simple. To explain their name-sake, their information implores that they are a “brotherhood…willing to ‘resist’ the temptations of a materialistic, hateful, pessimistic world.” They conduct themselves to an anti-corporate corruption creed and wear an insignia of anti-ignorance and injustice. Resistance 13 is more than something to shake your head to, romp around your room rowdily with. They are an immediate intervention, a meaningful musical message with lyrics that are not only longing to listen, but lift you up. They have a hard-working wisdom and a respectful resiliency and music is the medium they’ve taken to materialize their movement and provide perseverance to people. They are an epithet of existence and adhere to an adage, present a very professional, political, positive proverb: suicide prevention. Describing themselves as “the sound of revolution,” their motto seems to be, “We fight for lost causes.” They recorded a 3 song EP at Spider Studios in Cleveland working with producer Tony Gammalo, are ranked number 3 in the Ohio Valley for metal bands on Reverbnation and their songs are up for download on iTunes. In their metal music is thought-provoking prose, and they even quote one of my favorites, T.S Eliot. This Saturday, January 14th, Jagermeister Presents Lost Chapter, HateDriven, and Resistance 13 at The Lafferty Moose in Lafferty, Ohio at 9 P.M. They also have an on-air interview with Eagle 107.5 on Loud and Local on January 15th at 11 P.M. which you can also stream live at www.iheartradio.com, and are in the running for playing at Rock on the Range, which you can vote for here! Sara Fincham: You have such a meaning and a driving force behind your music. You have passion permeating and you’re fighting for a cause. Does that kind of responsibility make it easier or harder as a band? Jeremy Wright: Any time you make a choice to lead by example or principle of what you stand for there is a certain amount of responsibility that comes with the territory. I think it’s been easier because we know what we’re fighting for and what’s important. We’re not perfect by any means, but you don’t have to be to understand the basic principles of right and wrong. It doesn’t matter to me whether people approve or disapprove. All that really matters is that we’re doing what’s right. SF: What brought the band together in the first place – an ally kind of agreement about the music industry, about anti-bullying, etc, or just music in general – this is my what came first the chicken or the egg type question – what came first for you – the music or the message? JW: The music definitely came first. Bryan and I have been playing music since we were young. We had our first band when I was 18. The youngest member, our bass player, was only 13 and we were playing in bars. We were the opener for a Pittsburgh based band (Viscious Cycle) that played all over Ohio, West Virginia, and western Pennsylvania. That project stayed together for about a year before it fell apart. After that, Bryan and I kind of lost touch until about 6 years later. We ran into each other again and decided we really wanted to do something together musically. At the time I was also playing music with a good friend of ours, Luke Tenley. Luke and I had been trying to get something together for years, so the three of us found a bass player and the first lineup for R13 was born. The message has always been there but I think as we got older its intensified. In order to understand the message you have to understand the individual. I’ve always wanted to use my music for something bigger and it’s hard to see so much going on around us and not say something about it. In those six years so much happened for both Bryan and I. I can’t speak for him but I can speak for myself- it was like being reborn. When you’re tired of your life and the way it’s going, you really only have two choices- sink or swim. You fight for what you want, or ultimately, you die. Those 6 years, for me, was a time when I had lost a lot of people in my life that I loved and bad luck seemed to be following me everywhere. It was definitely an all-time low for me. I was at the bottom of the barrel and I was sick of it, then something happened. I can’t explain what it was. I made a conscious decision to get up. I would get up and I would fight for what was important. Everything that I had to say, every action, every decision I made in my life would be devoted to those who loved me and never gave up on me. A large portion of the words I speak are not my words, they were given to me by those that loved me. Once you help someone for the first time it’s infectious. For every word we speak, for every song we sing, for every move we make and every note that’s played its done in devotion. What really got the band started and got us moving was the fact that Bryan and I had a really good friend who died in an car crash. We cared so much about him and to us he was family. He was so supportive of what we were doing and he was an amazing individual who was so selfless. This is really the basis of where our message stems from. SF: Obviously you’re starting to get some exposure. Has it been hard to hustle and get yourselves out there, or have people/places/promotions been open to listen? JW: Yes, it’s easy to get people to listen, but the question is did they hear what we were saying? I think people are finally starting to get what we are saying but it still continues to be a struggle to break those boundaries and walls that they’ve thrown up. This is why we have chosen to use music as a catalyst for our message. It’s a good icebreaker and it’s common ground that we all have. A large portion of society’s youth are being raised more by music than by their own parents. It’s their outlet. The best feeling is telling someone your message and seeing them light up with hope. Right now it’s basically been fifty-fifty. SF: You are all very eloquent, smart musicians and are about more than just being a band. How long have you been outspoken about suicide prevention and has that had anything to do with your own personal problems that you’ve had to hurdle? JW: I think it has always been an underlying theme for us. If you think about the worst case scenario for someone who is a product of unfair circumstances, the end result all boils down to one thing. According to the National Foundation for Suicide Prevention, every 15 minutes someone in the U.S. dies from suicide. This means in a 4 hour rock show 16 people would have ended their life due to unfair circumstances or irrational thoughts. The worst part of the situation is that when there is no one around to hear you it becomes an internal struggle. We want our fans to know that WE ARE listening. Aside from playing music I also work with troubled youth. For five years I have heard their stories and the truth is that IT IS happening right here in the valley, regardless of what people may think. In a way, we speak for them as well. A large portion of the story for me and the guys is that our lives have not been easy but we made it and young people need role models now, so why not lead by example? SF: You certainly don’t lack passion in your playing and performing. What other elements do you think make you a breakout band? JW: The fact that we’re stating what a vast majority of Americans want to say, but are afraid to, for fear of being judged makes us a breakout band. The people of America are on the move right now, especially the lower and middle class, and they’re tired of being pushed around. If you listen to the words in “Build An Empire” that’s basically what it’s about. It’s about educating yourself on your surroundings, doing what’s right, speaking your mind, being an individual, being open minded, and finding “self reliance.” Everyone is so stuck on complaining about our government right now and choosing sides that they’ve overlooked what’s important. A large part of the problem can be fixed internally by the decisions you make as an individual. SF: What changes, if any, would you like to see in the local scene? I would really like to see music make a comeback in the valley! JW: I think a lot of the changes that have needed to happen in the scene are already happening. Live music in the valley is starting to evolve and there are so many different styles right now that you can catch. New venues are opening up and taking live acts again. It hasn’t been this way in a long time. What will really make or break the scene is whether or not people in the valley make it out to attend shows, and right now there is a huge fan base out there. What has needed to happen for a long time is for local bands in the area to work together to build the scene up. This is something that has really been a driving force in the valley recently. If there were any changes I would like to see in the valley, I would like to see more venues come about, more bands evolve, and more involvement in the community by those musicians participating. But I can’t say that it’s not already happening because music in the Ohio Valley is evolving and growing stronger than it ever has. SF: Some lyrics from your song “Build an Empire” are ‘So tired of hiding from the circumstance I can escape…I refuse to compromise.’ Can you elaborate on that? Are we sometimes victims of our own circumstance, and how so musically? What, to you, would be compromising? JW: Absolutely. First off, yes we may be victims of our own circumstance, but it’s important to keep in mind that it’s how we choose to respond to the situation that determines who we are. So, in a sense, the line states that we choose to sit with our head in the sand other than to face adversity and “unfair circumstances” head on. Ultimately, anyone can complain about what they don’t have, but the reality is that we all face unfair circumstances, we all have to deal with loss, and we all have situations which are presented to make us stronger. It’s how we choose to react in that very moment that establishes character for who we really are. If a horrible car accident happens and you drive right by without hesitation, that says something about who you are. “Build an Empire” is about facing your problems. You get up, you stand on your own two feet, you accept what happened in the past, and you get moving. In the context of compromise- that’s referring to conformity. Society has given up on a lot of their core values. A large portion of the world in my opinion is hateful, judgmental, resentful, conceited, selfish and full of greed. These are not values that we want for ourselves and AT ALL COSTS we refuse to give in! SF: Promote your upcoming interview on The Eagle! JW: We’re really excited about the opportunity to be on Eagle 107.5. The interview will air on Sunday, January 15th at 11pm on Eagle 107.5’s Loud and Local with Nick Nash. Resistance 13 will hit the airwaves for the first time. You can also check out the interview on IheartRadio, which is something that we’re pushing as well. It’s really great to think that our friends from out of town can still hear us even though they’re not in the area thanks to Iheart. This really is a big opportunity for us and will give us much more exposure to get our music out there. We would like to thank Sara’s Soundcheck for taking the time to interview us and we look forward to talking in the future. Thank you for your time! SARA’S SOUNDCHECK ROCKS! Next The Spinlords: Music in 3D!